Small and medium-sized manufacturers have had a tough time competing in the global marketplace. 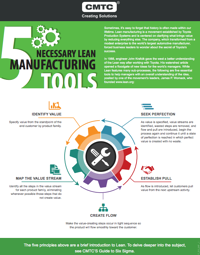 Many manufacturers have learned that making the organizational commitment to master the concepts of Lean will increase the focus on the customer. For more information, contact us for a complimentary consultation to review your needs and provide innovative solutions for your business.